Infinix set to roll out Android 7 Nougat to all the Infinix Hot 4 users coming June 2017. Meanwhile, a Beta testing update is currently available for you to download and feel the new OS pending when the stable version will be officially be rolled out via OTA. 3. Battery Optimization: Battery drain faster than a leaking pocket. 5. Now While Calling, can’t hear both sides properly Mic and Speaker deliver voice really low even volume is at maximal. The official version of this update set to be rolled out via OTA coming beginning from 5th of June 2017. Where Can I Download Android 7.0 beta 2 for Infinix Hot 4? >> Choose the file you downloaded to your SDcard and click on Install. That's all friends. Now, you can enjoy Nougat on your Hot 4 device pending when the official update will be rolled out via OTA. 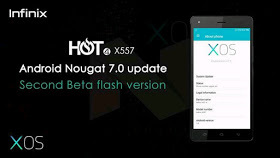 Infinix Hot 4 X557 Android Nougat download. 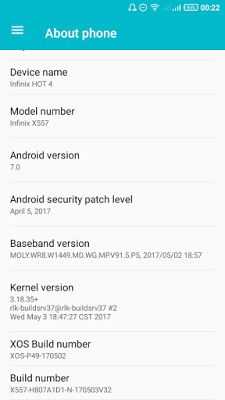 Download Infinix Hot 4 X557 Android 7 Nougat update. 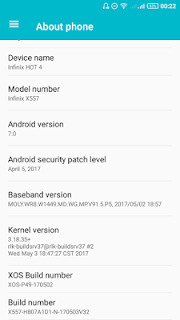 Infinix Hot 4 X557 Nougat update download. It's for the second Beta update. That's why it's called Beta 2 update.